In this Presentation, KiTek Group overview about WPEngine Affiliate Program. Affiliate Programs are good for Bloggers. Bloggers can Make Perfect income with Affiliate Marketing. WPEngine Related to Web Hosting industry. Up to $10,000 you can earn on just one referral. WPEngine pays $200 per single sale or 100% of the 1st month’s payment (higher Payout). WPEngine Provides Links and Banners to grow your Affiliate Promotion. Cookies: ShareASale tracking software allows for affiliates to be credited up to 180 days after the 1st Click on your Affiliate Link. Bonus commissions start from 5 sales per Month. Firstly, WP Engine is a popular service that is well liked by many people in the WordPress community (many do not like their service, but that can be said about many other large hosting companies). Secondly, their hosting plans are more expensive than traditional hosting companies which are how they can pay higher commissions. They have five pricing plans. The first three cost $29 per month, $99 per month, and $249 per month. If you refer someone to WP Engine and they purchase one of those plans you will earn a commission of $200, $200, or $249 respectively (yes you will receive a commission of $200 for referring someone to their cheapest hosting plan). 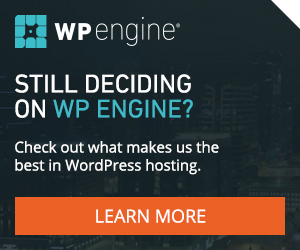 WP Engine’s premium and enterprise-grade plans cost much more. The exact cost depends on what setup the customer chooses. If someone opts for one of those more expensive plans, your commission for one customer could be in the thousands. That’s a helluva lot of cash for one referral.